Gary Cook for reviewing prior to publication. The name “Baikal” comes from the Buryat word for “big reservoir, like a sea” and “Baigal” in the Mongolian language means “natural.” The Buryat tribes are traditionally nomadic and embrace their Asiatic heritage, with emphasis on raising and exporting cattle. Olkhon Island, the largest island in Lake Baikal, is inhabited mostly by indigenous populations and is still considered an especially sacred place in the region. For millennia, the Lake Baikal region has been inhabited by various indigenous populations — particularly in the taiga, a subarctic coniferous zone — where they lived primarily by hunting and fishing. In 1643, Russian explorers first made contact with indigenous populations, but the area did not experience much Russian influence until the end of the 19th century, when the Trans-Siberian Railroad was built. Today, the Buryats make up nearly 30 percent of the population, while Russians make up most the remaining two thirds. With a depth of 1.2 miles, Lake Baikal is not only the world’s deepest lake but also the most voluminous freshwater lake, containing 5,518 cubic miles of water — amounting to 20 percent of the earth’s supply of unfrozen fresh water. The lake is estimated to be over 20 million years old, and because of the its depth, it would take 400 years for all of the water in Baikal to drain out through its only outlet, the Angara River. Lake Baikal is home to some 3,000 species of plants and animals, nearly half of which are endemic — including the Baikal seal, or nerpa, the earth’s only exclusively freshwater seal. In the 1950s, the Russian government, under Joseph Stalin, built the Baikalsk Paper and Pulp Mill in the face of organized protests by local inhabitants, introducing an era of industrial pollution. Although the protests were ignored, many credit these activists as founders of the environmental movement in Russia, which has only begun to emerge from muted repression some 20 years after the end of Soviet rule. With the fall of the Soviet empire, the public health system collapsed. As a result, traditional shamanism and medicine, as practiced among indigenous peoples, has seen a dramatic resurgence, as well as Tibetan Buddhism, practiced widely among the Buryats. The most significant Buddhist site in all of Russia lies in Chita, just east of Baikal, and was once threatened by a proposed gold mining operation. In 1999, the site was protected by the creation of Alkhanai National Park, thanks to a successful opposition campaign, and is now frequented by tens of thousands of devotees every summer. Today, there are three national parks and nine reserves around the Baikal as well as 16 towns and 50 industrial enterprises. While only one industry, the Baikalsk Paper and Pulp Mill, is situated right on the lake’s shores, other enterprises in the surrounding area include three hydroelectric dams, aluminum smelting and other chemical industries. Today, the average income of households in the area is approximately $50 per week, primarily generated through subsistence farming, cattle herding and hunting. In 1996, Lake Baikal was inscribed as a UNESCO World Heritage site, placing 3.15 million hectares under international protection. In the late 1990s evidence of dioxin, PAHs, DDT and other organochlorines that can cause birth defects in humans and animals were found at elevated concentrations in some species of birds and in nerpa seals in the Lake Baikal area. In 1998, the third in a series of U.S.-Russian meetings on dioxin was convened in Baikal under the partnership project, Uniting to Reduce Dioxin Levels in Human Beings and the Environment. The workshop outlined many different recommendations for government and NGOs to work on total elimination of emissions of dioxin and dioxin-related materials. Although the government has been unable to implement many of these recommendations, there is still hope that the situation will improve as various industries shut down near the lake. Due to the Baikal’s depth, size and its surrounding protected areas, major ecological threats such as overgrazing and resource extraction exist at the watershed level and in surrounding areas. Upstream of the Selenga River, Baikal’s main tributary, there is a “free range” approach to the grazing practices of most nomadic people, resulting in decimation of areas frequented by cattle. With the collapse of the Soviet Union, many of these people invested their only assets in cattle; some estimates show that in the 1990s, the number of cattle in some areas increased tenfold. This led to a tremendous nutrient overload and damaged the surrounding river ecosystems. Without attention, overgrazing will cause these areas to quickly suffer from desertification and will continue to harm ecological resources and eventually harm the cattle and herders themselves. Lake Baikal also experiences impacts from air pollution from coal-fired power plants and industry located upwind and west of the lake. Coal production in west Siberia gives rise to acid rain, which then affects the lake and its flora and fauna. In 1996, the Chemical Institute of the Russian Academy of Sciences found 175 picogram per kilogram of dioxin in the fat of the Baikal nerpa, which was thought to come from atmospheric transport as well as effluent from the Baikalsk Mill. Dioxin is thought to have caused the deaths of many seals near the Baikalsk plant in 1997 in particular. Oil and gas resources were located in western and central Siberia about 15 years ago. Although laws prohibit pipelines that would link to China or the Pacific to run through the Baikal watershed, plans for such a pipeline were under way and drew large protests from environmentalists. Perhaps as a result, in the fall of 2006, Russian President Vladimir Putin ordered that the pipeline be diverted north, away from Baikal’s watershed. In many ways, Baikal’s ecosystem is blessed with several forests that are high on mountains and inaccessible to the logging industry, which is crucial to mitigating erosion and desertification. On the other hand, there are forests in Siberia that will become more accessible if demand increases from China, which has illegalized logging in many of its own northern forests. At its latitude and with its climate, Siberia is not home to forests that regenerate quickly or easily, thus making the threat of increased logging more severe, not to mention the probability that most profits from logging in Siberia would go to the Chinese. As the Baikalsk Pulp and Paper mill is the only large industry directly situated at the lake’s shores, it has historically been a target of activists determined to shut down or change the plant’s practice of directly polluting the lake. According to Baikal Watch, the plant is experiencing such financial problems that it continues to downsize, now employing about 1,000 people. At this rate, the business might very well close entirely, which would be a boon for the lake, but will be a challenge for the town’s infrastructure, whose sewage is connected to the mill’s system. The grassroots protest against the Pulp and Paper Mill over 50 years ago — at a time when such activism was illegal — is evidence of how much Lake Baikal is valued as a cultural and ecological resource. Aside from that effort, environmentalism in Russia emerged about 15 years ago, and the growth and determination of the movement at Lake Baikal is impressive. Preservation efforts are aimed at diverting industry away from the area and building more sustainable sources for economic development, such as ecotourism. 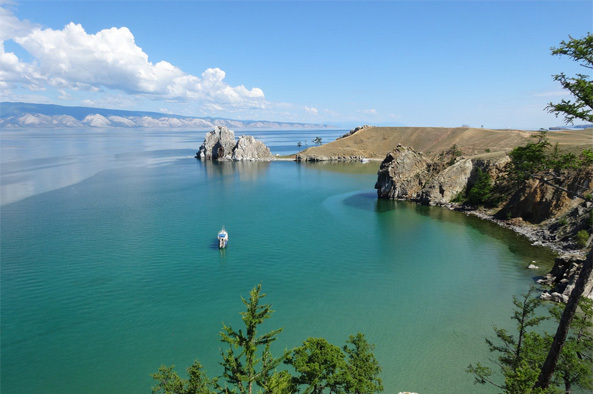 Today, there are several nongovernmental organizations working to preserve and protect the resources of Lake Baikal and its surrounding areas. In the town of Irkutsk, the Baikal Ecological Wave works with other NGOs such as Baikal Watch to educate the local public and put pressure on government decision makers to protect the wildlife at Baikal, especially the nerpa. They also promote research, education and direct action by locals to counter the polluting activities of Baikalsk Pulp and Paper, which continues to release toxins including dioxin into the lake. Through NGOs such as Baikal Watch and Pacific Environment and Resources Center, United States activists and supporters have helped the movement to preserve Baikal. Started in 1990, Baikal Watch, a project of Earth Island Institute, has conducted training programs to build the capacity of hundreds of park officials as well as Russian and other former Soviet colleague activist groups. Other U.S.-Russian collaborated efforts to preserve Baikal are the Tahoe-Baikal Institute, which has arranged exchanges between scientists and government officials from each country to visit both of these unique lakes to exchange information and experiences. One of the best assets of Lake Baikal is that there are few roads or major development directly on the lake’s shores, so it holds great potential for developing ecotourism and drawing visitors to experience its uniquely remote beauty. In an effort to spur this process, Baikal Watch and various partners at Baikal have started to build the Great Baikal Trail, which entails 1,000 miles of scenic trail, connecting three national parks and four nature reserves around the lake. Volunteer to spend a week or more helping to build the Great Baikal Trail. Support the work of the Baikal Watch, the Great Baikal Trail Association and the Tahoe-Baikal Institute. Learn about other ecotourism trips and other volunteer opportunities at Earth Island Institute’s ecotourism website. Cook, Gary (director of Baikal Watch). Personal communication, October 30, 2007. “Combating Dioxin and Toxic Pollution in Lake Baikal.” Baikal Watch, May 30, 2000. Mackinnon, Mark. “New battles loom over Russia’s great lake Plan to pipe water to a thirsty world pits entrepreneurs against ecologists.” The Globe and Mail (Canada), August 13, 2002.